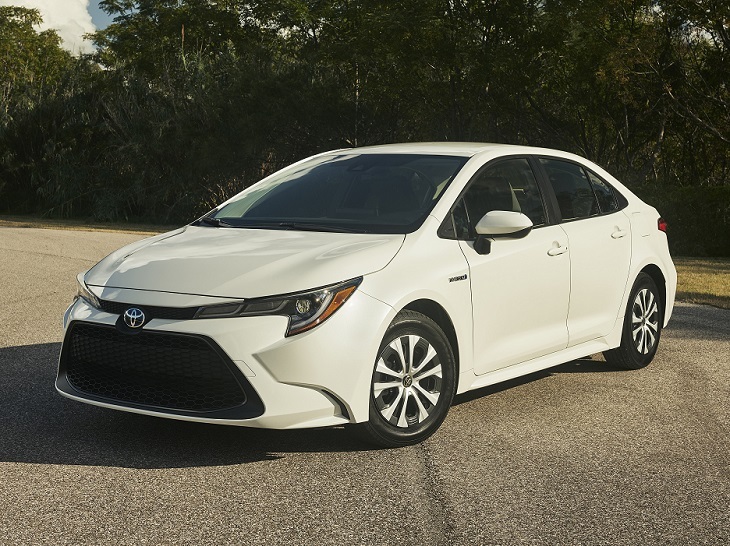 Toyota recently introduced its redesigned 2020 Corolla sedan, which is essentially a 4-door version of the 2019 Corolla Hatchback. There is, however, a twist, and it comes in the form of the new 2020 Toyota Corolla Hybrid sedan. Introduced at the 2018 Los Angeles Auto Show, the new Corolla Hybrid sits on the same platform and uses the same drivetrain as the popular Prius, a proven technology that is expected to return a projected 50 mpg or better in the Corolla Hybrid. Visually, the Corolla Hybrid looks the same as a standard Corolla. Aside from “Hybrid” badges and 15-inch wheels with low-rolling resistance tires, it looks identical to a 2020 Corolla LE. Inside, Toyota adds unique instrumentation allowing the driver to reference data specifically pertaining to its Hybrid Synergy Drive powertrain. An Eco Accelerator Guidance function can “coach” the driver while he or she attempts to maximize the car’s efficiency. The Corolla Hybrid also has an S-Flow climate system designed to work as efficiently as is possible, and an electric Positive Temperature Coefficient heater rapidly warms the cabin on chilly winter days. Sometimes hybrid vehicles have less passenger or cargo space, but that’s not the case with the Corolla Hybrid. The car’s battery is compact enough to fit under the back seat, preserving both passenger and cargo space. A 60/40-split folding rear seat expands utility. Lifted straight from the Prius, the Corolla Hybrid uses an Atkinson-cycle 1.8-liter 4-cylinder gasoline engine and two electric motor/generator units to produce a total output of 121 horsepower. A continuously variable transmission powers the car’s front wheels, and the driver can choose between Eco, Normal, and Sport driving modes. The Corolla Hybrid’s nickel-metal hydride battery recharges via the car’s regenerative braking system, and stores enough energy to power the car in an EV mode at low speeds for short distances. When the car is operating in EV mode, it emits a Vehicle Proximity Notification to pedestrians who might not otherwise realize that a vehicle was operating nearby. In addition to its new structural engineering, the Corolla Hybrid offers a robust suite of driver assistance and collision avoidance systems. Called Toyota Safety Sense 2.0, it equips the car with a long list of standard safety technologies. Toyota equips the 2020 Corolla Hybrid with the mid-grade version of its Entune 3.0 family of infotainment systems.